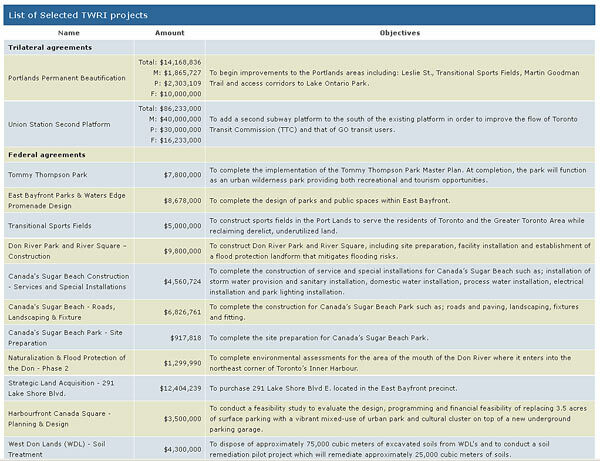 The federally funded projects outlined in TWRC’s Long-term Funding Plan have been successfully implemented and completed. In doing so, the polluted land in the region has been reclaimed through soil remediation, the cleanup of main pipes, and the decontamination of the land. The TWRI contributed significantly to the economic development and growth in the waterfront area, which also became more accessible and usable. To conduct projects effectively, the TWRC implemented a consultative approach whereby the public was regularly consulted and informed on project progress. Portals on TWRC’s website were developed so that stakeholders, as well as the general public, could follow and regularly provide feedback on projects. The TWRI was managed according to tri-government environmental policies that were in place at the start of the program. Between 2004 and 2013, the TWRC won over 50 awards in urban design, environmental management and public consultations. However, the contribution agreement approval process and the structure of the contribution agreements also created delays for some projects. For example, each layer of government review considerably lengthened the approval time. Also, at the federal level, the terms and conditions of the contribution agreement do not allow funding to be transferred from one project to another should there be an unexpected delay in implementation. The $10 million threshold for contribution agreements, set by Treasury Board, was found to be too low for many of the TWRI projects. Originally, the federal contribution to the TWRI was planned to end in 2007–08, but the program was extended and the final payment was issued in 2012–13. Ultimately, this resulted in less being achieved with federal funds in comparison to what was originally planned. 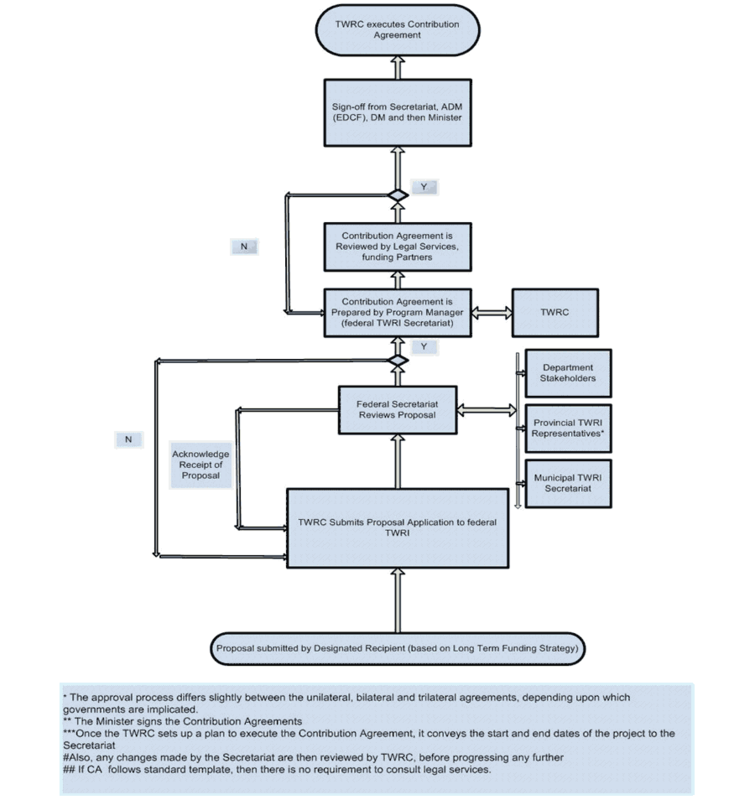 Overall, the TWRI was found to be relevant and to have achieved its stated outcomes. 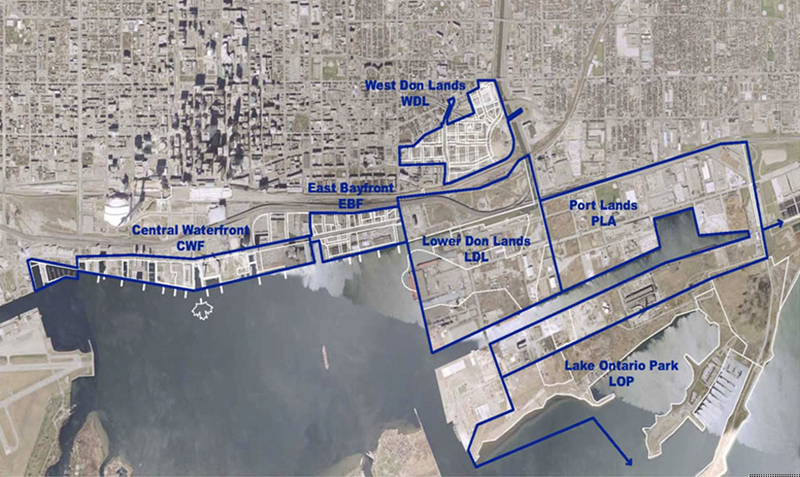 Please click here to read the complete Evaluation of the Toronto Waterfront Revitalization Initiative.